Silent Gliss curtain tracks introduced the unique ‘wave’ curtain heading system that turns traditional curtains into a striking modern design statement. 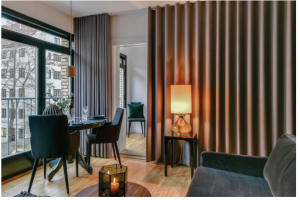 As an alternative to traditional curtain headings such as pencil pleat, pinch pleat or goblet, the wave system offers a more contemporary, neat and stylish curtain presentation. The finished appearance is similar to that of eyelet curtains but fabric hangs directly below the track in a neat and uniform style. The ‘wave’ effect is created through combining a specially designed heading tape and Wave glider-cord to get a soft and simple continuous wave effect. When opened the curtains stack back neatly and straight and when closed the fabric hangs in a smooth continuous wave effect. Please view our YouTube video that explains this in more detail. 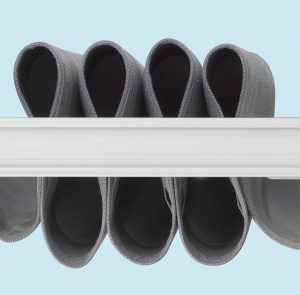 Please note you need to use the wave heading tape to achieve the wave effect, so you can’t purchase ready made curtains and put these on a curtain track with the wave gliders. 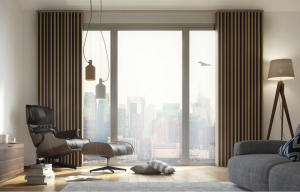 If you are having your curtains made you will need to let your curtain maker know that you would like the wave heading system (please see workroom guide below). The wave heading system is available in 2 sizes for domestic application. You can specify either 80mm or 60mm wave gliders. The measurement is the distance between each glider, so with 80mm waves you get deeper but fewer ‘waves’, and with 60mm waves you get slightly shallower ‘waves’ but more of them. There isn’t really a right or wrong choice between them, it really comes down to personal preference and the look you’d like to achieve. Please click here to view the Silent Gliss Wave Brochure. Wave Stack Back: as a general rule the stack back is approximately 23cm per metre of track for 60mm wave gliders and 18cm per metre of track for 80mm waves. Please remember to divide the total stack back by 2 for a pair of curtains. Please note this is only a guide and it’s always best to double check with your curtain maker. Please note we cannot be held liable for any stack back miscalculations. Please email us sales@thehomeofinteriors.co.uk or call us on 01625 449039 if you would like a quotation for a track with the wave gliders. We will just need to know the model of track you are considering, the track length and if you require 80mm or 60mm wave gliders. There is no standard test that will indicate whether a fabric is suitable for Wave. However, experience suggests it is normally suitable for: voiles, lined cotton, interlined silk and blackout linings. The soft curves of Wave do not lend themselves to: stiff fabrics, heavy embroidery, irregular vertical stripes or metallic threads. There is more information in the Workroom Guide (link below). Please click here to download the Silent Gliss Wave Heading Curtain Workroom Guide. This is particularly useful if you are going to make your own wave heading curtains as it has lots of practical advice. We sell all the Silent Gliss accessories so if there is something you require that you can’t find on our website please give us a call and we will happily give you a price. The Silent Gliss Wave Heading Tape and Iron On Wave Hemming tape are popular purchases with wave tracks. 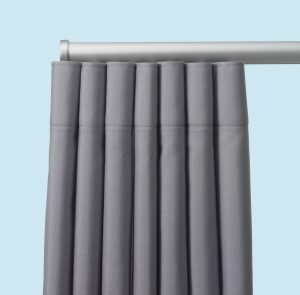 The Silent Gliss Draw rods are also popular so you don’t have to touch your beautiful curtains! These attach to the leading glider on your curtains and enable you to open and close your curtains with the wand. The wand sits behind the curtain when not in use so it’s nicely concealed. Please do get in touch if you require any advice or have any questions. Thank-you Debbie, Dee and the Home Of Interiors team.